Domestic Carnivore started with a passion for the health and wellbeing of our pets. Gord and I partnered to share our passion with other pet owners. In June 2013, our dream became a reality and we opened our store in Dundas, Ontario. Domestic Carnivore is not your typical pet store as we focus on education, not sales. We provide pet owners with information about raw diets so they can make the decision that is best for them and their pet. Gord and I have over 20 years of combined experience feeding a raw diet to our dogs. My first dog, Mike, had severe skin irritations and was on a prescription for long-term prednisone. After spending thousands of dollars on veterinary testing and visits to specialists, it was recommended that we try raw. We immediately saw an improvement and Mike was a healthy, prednisone-free dog in less than 6 months. The red, irritated skin was gone and his coat was growing back. Best of all, he loved his diet and we saw his playful personality return. Mike at age 11 with his beautiful coat (right). We believe our commitment to the diet and passion for pet nutrition make Domestic Carnivore your best source for a raw pet food diet. This commitment means you will only find high quality, raw diets in our store. We proudly carry Canadian sourced raw food and we hold our suppliers to the highest standards. We live by the principle that “If we will not feed it to our own dogs, we will not feed it to yours”. Our suppliers source quality ingredients within Canada from federally or provincially registered meat plants. Fruits and vegetables are brought in fresh from farmers that are local to each brand. We also require each supplier to have a complete nutritional analysis for each product line. This allows us to examine each diet more closely and make recommendations for each individual dog or cat. We ask potential suppliers questions to determine why they got into the industry, how long have they been in the industry, what safety measures they take, etc. We also discuss their knowledge of canine and feline nutrition and find out how their diets are formulated. These conversations allow us to understand if the company is committed to the health and wellbeing of our pets. 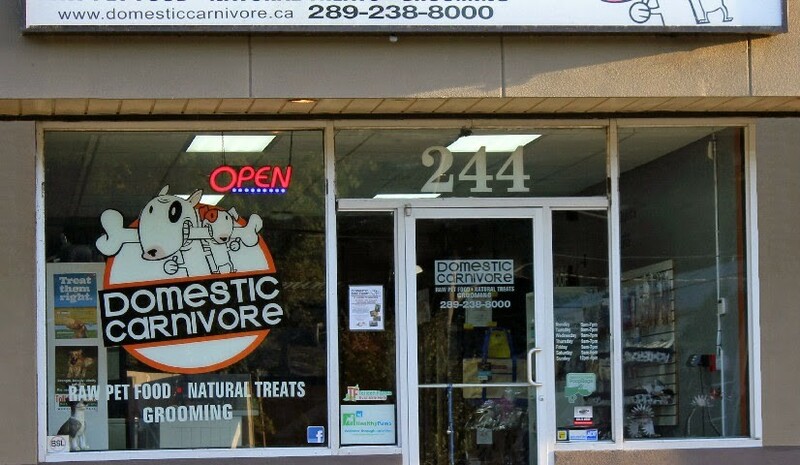 Domestic Carnivore – 244 Governors Road (Dundas, Ontario). Once we are comfortable with the people behind the product, we want to make sure that the product itself meets our standards. We look at things like the ingredients, the consistency of the grind, and the overall appearance of the food. The Domestic Carnivore dogs are always the first ones to try out a new food. We examine how they respond to the food and we look at how it is digested. Domestic Carnivore is proud to provide an excellent selection of balanced raw diets from quality suppliers. Brands like Tollden Farms, Healthy Paws, Carnivora, Mega Dog, and Bold Raw are committed to providing healthy, affordable, and convenient raw diets for your pet. 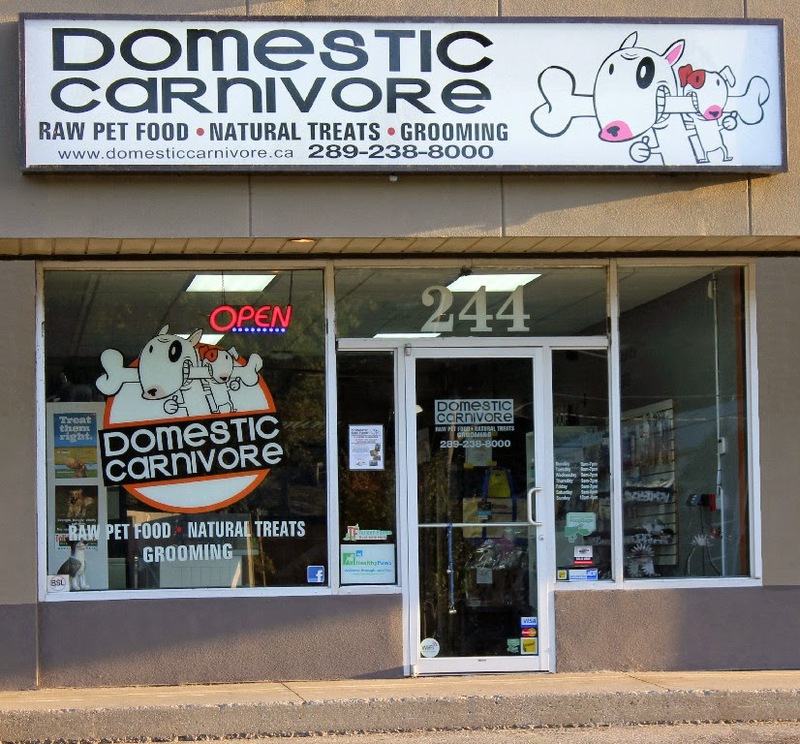 Domestic Carnivore is honoured to be your trusted source for raw pet food, nutritional information, and overall pet health.